Ibanez's Iron Label guitars have been made with Metal and nothing but Metal in mind, and using more than 30 years of Ibanez ingenuity have been modded and tweaked into the heaviest sounding metal axes ever built. 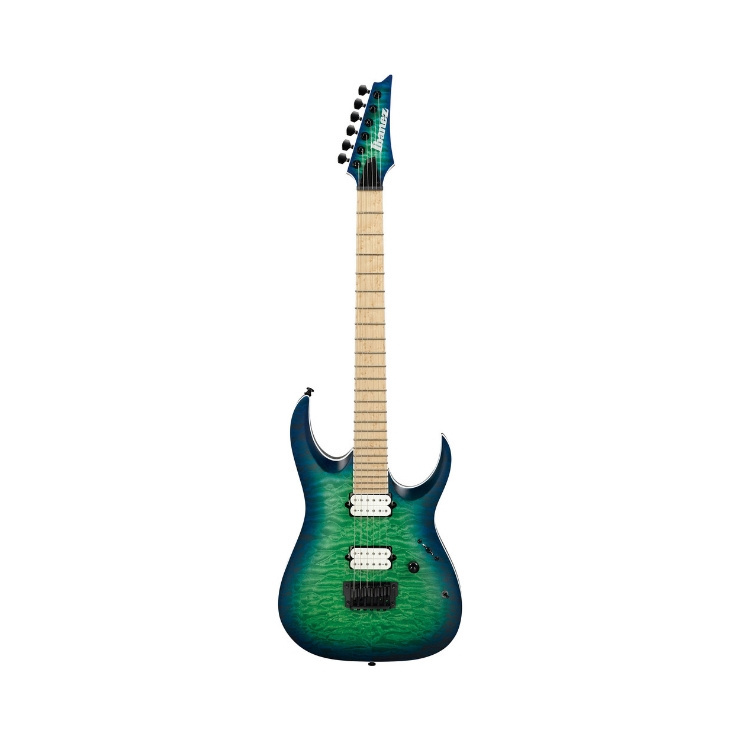 With the Ibanez RGAIX6MQM-SRB you get a guitar that's every bit as premium-grade as other instruments in the Ibanez Prestige range, at a very reasonable price. Designed to offer the feel of a precision made instrument that's capable of interpreting your every move with power and accuracy, the RGAIX6MQM gives you a sense of unrestricted playability, letting your fingers do the talking without any barriers. Featuring a solid mahogany back topped with a piece of quilted maple, finished in Surreal Blue Burst, and ergonomically sculpted to comfortably fit your body, the RGAIX6MQM-SRB looks and feels every bit the professional instrument. Complimenting the looks, you get a 3pc Nitro Wizard neck with bound Birds Eye Maple fingerboard, a pair of DiMarzio Fusion Edge humbuckers with Coil Tap switch, Gibralter Standard II fixed bridge, and Gotoh MG-T locking machines, all of which comes together to give you the ultimate metal playing experience. Specially designed to offer players the perfect balance between playability and stability, this Nitro Wizard neck is not only super-thin and ultra-playable, but is made with a 3pc construction of Maple and Purpleheart woods. Designed through close collaboration between Ibanez and DiMarzio, these Fusion Edge humbuckers give you a powerful, distinctive tone, with a crisp, cutting high end, and a tight, compressed bottom end, but without any of that muddy mid-range. Add to this a Coil Tap switch that allows you to choose between a Full Output option, giving you a more modern sound, or a Lower Output option for a more vintage-like tone, and you have yourself an incredibly versatile axe that you can use to produce a whole host of classic and modern metal tones. Gibraltar Standard bridges have long been offering Ibanez players a fixed-bridge alternative to the usual locking trem bridges generally found on their guitars, and are renowned for their superior tuning and intonation stability. With the Gibraltar Standard II you have a bridge that's been designed to unify with the guitar's body, providing you with the optimal amount of transfer for each string's vibration too. With the RGAIX6MQM-SRB, the Gibraltar Standard II is perfectly complimented by a set of Gotoh MG-T locking machine heads, that not only offer you an incredible amount of tuning stability, but also help you cut down on string changing time.